Palmia Observatory: Astronomer just barely captures image of Algol during eclipse minimum; Christmas Lights? Bah humbug! Typical Algol Light Curve; Happy Holidays! Astronomer just barely captures image of Algol during eclipse minimum; Christmas Lights? Bah humbug! Typical Algol Light Curve; Happy Holidays! asymmetric range of motion on my new camera tripod and some Christmas lights turned on brightly after I had already set up. The photo below shows my selected viewing location. 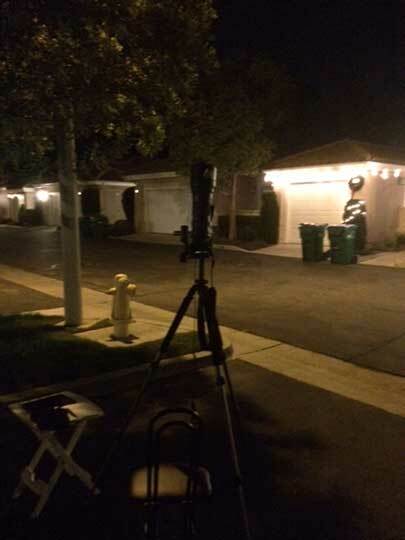 When I started the observing session at about 7:00 pm, the neighbor's Christmas lights were not on. You might notice that I seem to be setup under a tree? Yes, that is correct. The tree strategically blocks out the light from a street light. Ok, ok, I agree it doesn't seem to be a very ideal spot for observing, but it was conveniently close and there was good visibility near Algol. Around 8:00 PM, the lights came on. I didn't really want to ask the neighbor to turn down the lights. At the same time, I got a couple of hours observing in, so I didn't mention to her either that the lights came on hours after sunset. Thanks Neighbor, Audrey! Christmas Lights on timers? Bah Humbug! Anyway, I managed to take a dozen images of the location where I imagined Algol was located, since I couldn't see anything there at all. I used the old fashioned star hopping technique and started with bright Capella and then went straight up to slightly dimmer Almach, and then just a little right turn to where I remembered I had seen Algol before. It turns out that Algol was already well along in its eclipse period and I could not see it at all, but I dutifully took images every 15 minutes or so. As Algol moved higher and higher in the sky, I eventually discovered that my tripod was at its range of motion and I couldn't move the line of sight any higher. Oh, oh, what to do? At the same time, some Mormon missionaries were just leaving after visiting one of our neighbors, and they stopped to chat and offer their support. Thank you ladies! I refrained from cursing at my situation and realized I could turn the camera and lens around and in that direction the tripod had more range of motion. The only difference was that the pan handle, which is normally in front of me for ease of control, was now on the other side of the tripod and I had to operate it in reverse from what I was used to doing. Anyway, I could continue following Algol's location as it climbed higher and higher in the sky. It turns out that I didn't remember very well at all where Algol should be found and was off course by 4-5 degrees and most of my images did not include Algol. One lucky shot that I made just as I was shutting down did just barely include Algol. 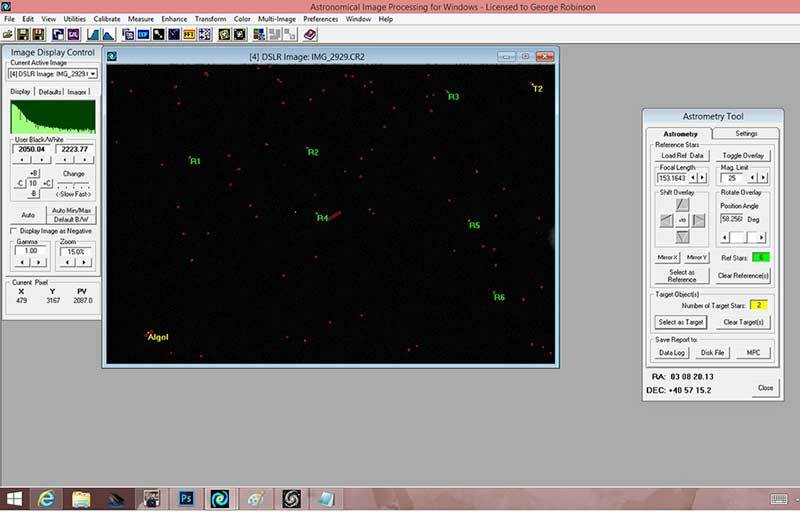 The image below shows the AIP4WIN analysis screenshot where Algol was found to be just near the bottom left hand corner of the image. Remember at the time I took the images, I could not see Algol at all, it was just too dim. It was only latter when I analyzed the images and found that most of the images did not include Algol. I used the AIP4WIN Astrometry Analysis Tool to overlay a star map from the star catalog and then pushed and rotated it around until the catalog stars were overlaid directly on top of the stars in my image. 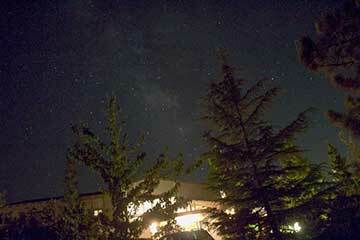 Then, I could interrogate the position of the brightest star in the image, which turned out to be Algol as shown. You can see that the displayed RA and Dec, for the star at the location where I marked it as "Algo"l, is within a arc minute or two of he RA and Dec for Algol listed in the star catalog. Yep, its Algol all right! Now, that we have confirmed that Algol is in that image, just how bright is Algol at this time during its eclipse? Well now the AIP4WIN Star Image Tool can be used to sum up all the light in the pixels that show up in the star image. The total pixel count is 259,044. The maximum pixel value of 11,509 is a bit too high and represents some possible non-linearity in the measurement due to near saturation of some pixels. I meant to correct for that by setting my exposure time back from 2 seconds to 1 second, but when I couldn't see many of the dimmer stars, I got scared and decided to leave the exposure time set at 2 seconds. With this estimate of the light coming from Algol during the eclipse, we are now in a position to estimate the magnitude. Normally, Algol is a magnitude 2.1 binary star. 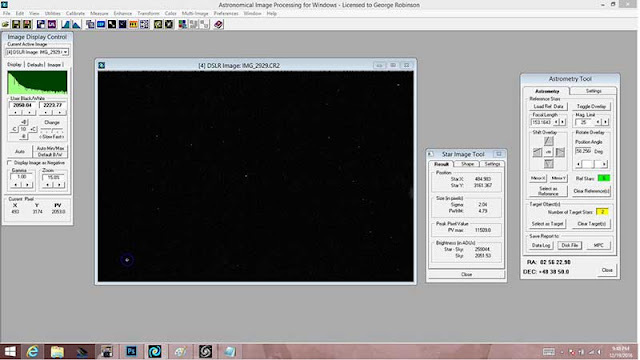 On the previous night's observation of Algol, the total pixel count for its light was measured to be 507,990. Wow, right away we can see that the amount of light coming from Algol during the eclipse has decreased almost in half. We can use the normal magnitude and this difference in light in the pixels between these two measurements to estimate the magnitude during the eclipse. How do these measurements get converted to magnitude? Well, if this were to be done correctly, I would first have to compensate the pixel count for the effects of the atmospheric viewing. The two images used were taken at different sky elevations and so the amount of atmosphere through which the light has travelled is different. Observations made directly overhead have the least attenuation due to atmosphere and those observations made near the horizon have the most attenuation. I have chosen to neglect that compensation for this first attempt at measuring the eclipse. This is not too bad of an approximation because my measurements were all made with the camera pointing above 65 degrees elevation and ended the evening at about 80 degrees. Secondly, I would have to compensate for the vignetting effects due to the camera lens which causes different amounts of light to be measured for the same object seen in the middle of the frame from the same object seen at the edge of the frame. Again, I started to collect some flat images so that I could make this correction, but didn't complete the process. So, I neglected to perform this compensation also. But all is not lost. We can still provide an estimated magnitude for Algol during the eclipse. The change in magnitude between these two measurements is then given by the expression 2.5 * log (507,990 / 259,044) = 0.73. So, the measured magnitude estimate for Algol during the eclipse is 2.1 + 0.7 = 2.8. Ok, we have an estimate for the magnitude during the eclipse. Unfortunately, I wasn't able to collect any other datapoints to make a complete light curve for the eclipse. But I did find two pieces of information that provide more detail about the minima and the eclipse light curve. First, remember in the last December 18 post that there were two available estimates from Sky and Telescope magazine for the time of the minima. It turns out I received an email from Sky and Telescope Editor, Monica Young, saying that the annual calendar prediction was based on outdated databases and that the online calculator was correct. She also said the calendar was supposed to have a sticker on it saying that the predictions were not accurate. I didn't find a sticker but nonetheless we now know the minima would have been at 7:46 PM instead of 8:20 PM. Thank you Monica! Secondly, I assumed (for some unknown reason) that the eclipse was just a couple of hours long, but have since found a good reference that says the eclipse lasts about 10 hours, so by the time I started looking at Algol at 7:00 PM, the eclipse was well underway. No wonder I couldn't see Algol at that time! Take a look at the following graph provided courtesy of www.nightskyinfo.com , which shows that Algol's orbital period is 2 days, 20 hours and 49 minutes and the eclipse lasts for about 10 hours. 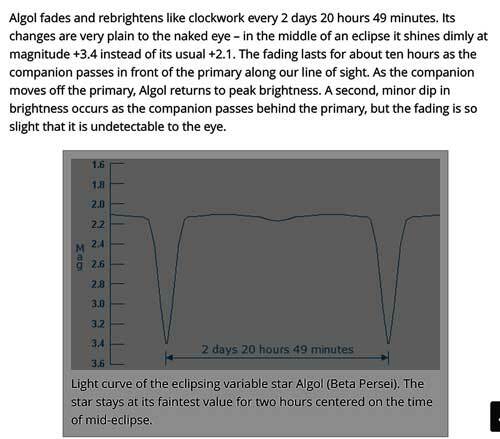 Note also there is another eclipse, just barely noticeable between the two dips, when the dimmer Algol companion is eclipsed by its brighter companion. I still have plans to do a complete eclipse light curve measurement, but that will have to be later, maybe next year. I'll be scanning the Algol minima times for when to schedule a longer eclipse light curve observing session, but until next time, the entire Palmia Observatory staff (Resident Astronomer George, Resident Astronomer Peggy, and Astronomer Assistants, Ruby, Danny and Willow) wishes everyone a Merry Christmas, Happy Hanukkah, and ... or for all Seinfeld fans, Happy Festivus!